Moshi's iLynx 3.0 is an advanced USB hub that adds four additional USB 3.0 ports to your Mac or PC. Built using the latest USB 3.0 technology, iLynx 3.0 offers uncompromising speeds at up to 5 Gbps to satisfy the demands of performance-grade devices such as external solid-state drives and Blu-ray/DVD drives*. More than just a data transfer hub, iLynx 3.0 also includes intelligent power management circuitry for full power delivery across all ports and features a high-output (10 W) charging port for your iPad. Most USB hubs require your computer to be on in order to charge a connected peripheral, but iLynx 3.0 works even when your computer is off, doubling as a convenient charger for your power-hungry devices. iLynx 3.0 is 100% plug-and-play, with no external software required. With its sleek design and unrivaled performance, iLynx is an ideal companion for your iMac, MacBook or PC notebook. *Apple SuperDrive is designed to function with a direct connection to your computer and is not compatible with iLynx 3.0. 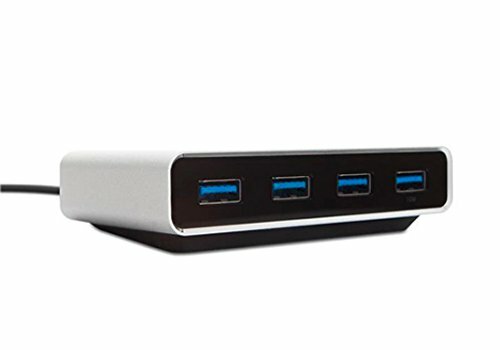 Provides 4 USB 3.0 ports with transfer rates of up to 5 Gbps. Dedicated high-output port (2.1 A) for fast iPad and iPhone charging even when your computer is off. Includes power adapter with 6-foot cable for convenient desktop use. Surge/ESD protection safeguards your devices and data from damage during hot-swapping. If you have any questions about this product by Moshi, contact us by completing and submitting the form below. If you are looking for a specif part number, please include it with your message.